For some disabled women, doing these things can be very difficult. Mammograms can be taken while a woman sits in her wheelchair. However, women need enough upper body balance to allow the breast to be put on the plate. Also, some wheelchairs can’t get close to the machine, particularly if the footplates or armrests can’t be removed. Can a chair be provided so you can sit down to undress? Is there a changing room and is this big enough for wheelchair users and /or a carer? Can you can hold on to something while the x-ray is being taken? Can an ordinary chair to be provided so you can sit down for the mammogram? Can a carer can help getting your wheelchair in the right position. Can a carer can help the radiographer get your breasts in position (the carer would have to leave the room during the x-ray to avoid unnecessary radiation). Is there anything that might help you remain still. Is the appointment venue accessible? Many women are screened in mobile units close to their GP surgery which have steps at the entrance. However, the unit can change the appointment to an accessible venue. If you have had a mammogram before, it is still best to contact the unit before the appointment. Things can change and not all units keep a record of what adjustments you need to have a successfully appointment. For some physically disabled women, barriers make it impossible to get a good enough image of the breast to benefit from screening. The radiographer will make a judgement about this or you might come to that decision during the appointment. In this case, the radiographer might suggest that you are still invited to be screened in 3 years, the normal length of time between breast screening appointments. You can then decide if you feel you would like to try again and let the unit know. If an x-ray is impossible, you should be given a leaflet and a video about getting to know what your breasts normally look like and changes that might be early signs of cancer. You can find out more about being breast aware from various websites. Unfortunately, these don’t have information targeted at disabled women who can’t do a self examination because they can’t touch / feel / see their breasts. However, these sites might be helpful in thinking about others ways of being breast aware, such as getting a partner to help or discussing it with your GP. Have you experienced physical difficulties during the mammogram? We’d love to hear your experiences. How can we make things better? Could we do things better? Take our survey – click here! This entry was posted in Breast cancer, Breast examination, Breast health, Breast screening, Mammogram and tagged mammogram, Physical disability. Bookmark the permalink. ← Patient Assisted Compression in Mammography – What’s that? Just had my first (and last) mammogram today! Are you kidding me??! I’m confined to a wheelchair so I can understand the limitations but honestly?! How long have these screenings been going on and they still have a machine that can’t even move sideways. Surely a robotic arm the size of one breast could be manoeuvred around to take a picture of one breast at a time?……side and front views?! Thank you and so sorry to hear that it was your first and last screening mammogram. As in the article, the technology is not there yet. Research is on going within the mammography design companies. I can share your comments with them. Please be breast aware and tell your GP about any changes to your breast tissue. I am a quad. and had a mammogram 3 years ago. The procedure was not easy because I cannot use my arms and the powerchair didn’t fit under the machine well. They are after me to do it again, but until they improve the procedure I am going to decline. I think with todays technology that shouldn’t be rocket science. Hi Andra, thanks for commenting and starting this conversation. Yes you are right. The technology is not there , I’d like to say yet…but it isn’t. At the moment, the mammography machine and taking the 2 views of each breast procedure is the well women service. There are other hand held devices that are used in developing countries. They are useful for symptomatic women in physically hard to reach countries but not specific enough for well woman screening who have no symptoms. Can’t an ultrasound be used? For a well woman, who does not have any concerns or symptoms of breast disease, then ,no, Ultrasound is not an option. For a woman who presents with a breast concern, then ultrasound would most likely be used after a mammogram had been attempted, with or without success. The health professionals would then be guided by the signs and symptoms that a woman presented with. To ultrasound both breasts may take about 20 minutes and it would miss many cancers. Disease that only shows up as small deposits of calcium are not seen on ultrasound. These are only seen on a mammogram. So you would not be able to be given reassurance that there were no signs of disease at that time. What will the future bring? Technology in this area is growing fast..we’ll post here when we hear of interesting developments. I had many screening mammos. 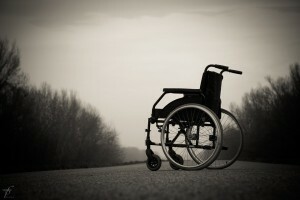 Last 2 years I started to have difficulty walking and I use a wheelchair, but if I could hold on something I could stand up. Today, had my first mammo using a Hologic 3D machine. It has nothing to be able to hold , to help standing. The older machines, GE, Lorad had always something to hold with your hands. I do not understand , when developing this new technology, the designer, did not think about helping the patient to hold on something so could stand? Is it any other 3D machine which will allow you to hold on something when standing in front of the machine?